I finished off the parts for the carcass for the Greene & Greene style cabinet this morning. 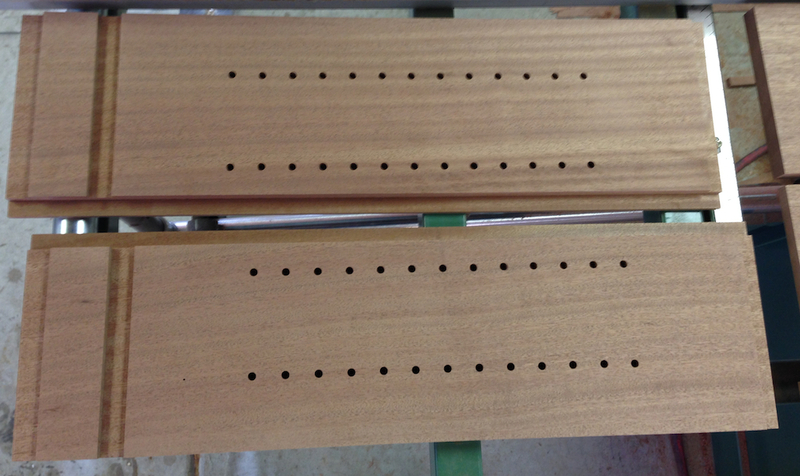 That involved drilling shelf pin holes, tuning up the surfaces and doing a finish sanding on the interior faces including raising the grain. I plan to use a water based dye on this project, so wetting the surface and scuff sanding off the raised nibs is important. The wood looks really nice even without finish, it has a nice sheen. It’s a little too pink at this stage, but it’s got more color naturally than the Honduras Mahogany I’ve worked with on other G&G projects. 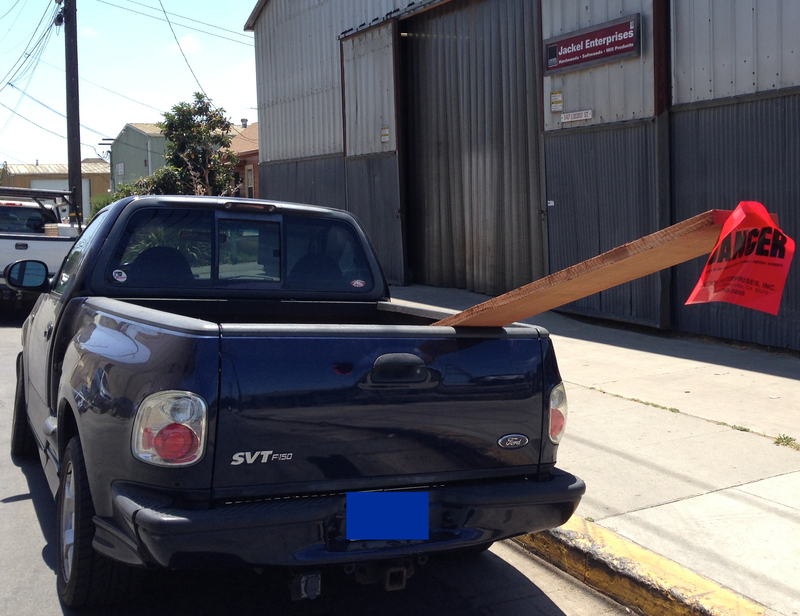 Before I assembled the cabinet frame I had to run down to the wood store, they close at 1:00 on Saturdays and allowing for beach traffic it takes 40 minutes each way. 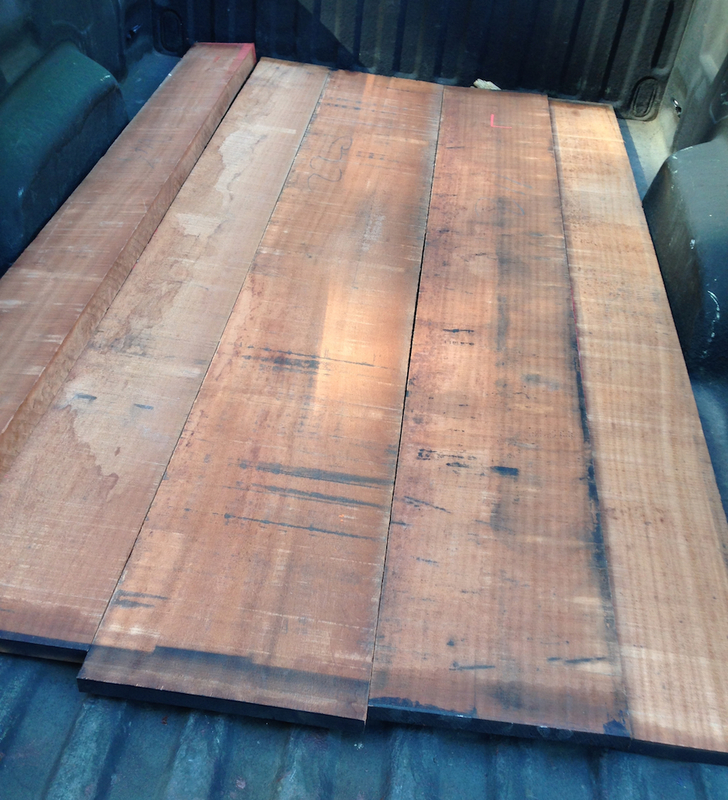 I picked up a nice board of 6/4 Sapele for the doors, which need to be 1″ thick. 5/4 would have been better, but plan in down the 8/4 I already had sounded too wasteful. It was a beautiful day here today, so even allowing for weekend revelers clotting up the interstate it was a nice break. 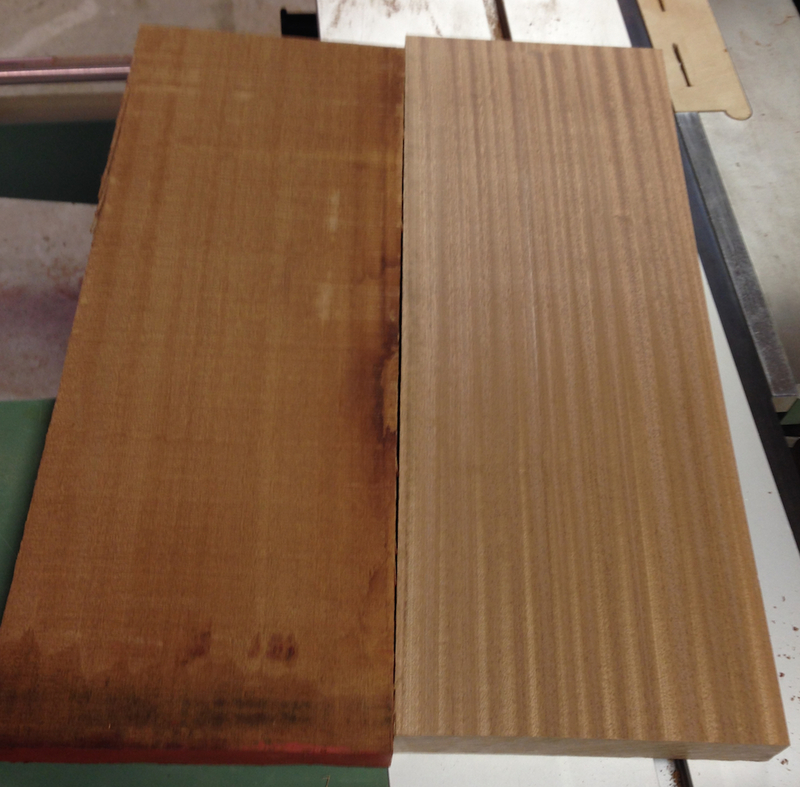 Back in the shop, the boards I’d dampened before I left were throughly dry. I gave them a scuff sand with 320 and assembled the carcass. I decided to skip gluing the joints, this is held together with three #8 wood screws in each corner, which seems strong enough, and I don’t have to worry about cleaning up any squeeze out. The large counterbored holes near the bottom of the sides are for attaching the skirts, which will be my project for tomorrow morning. I’m going to use some #10 pan head screws, and then plug the counterbores. Once the skirts are on I can install the sub-bottom into the dado. I also started milling up the stock for the doors, it’s rough milled and aclimating. I also cut a couple of pieces that I’ll resaw to make the shiplapped panels for the back tomorrow. With a little luck and some focus I can probably make a start on the door tomorrow. breaking down the stock for the door. 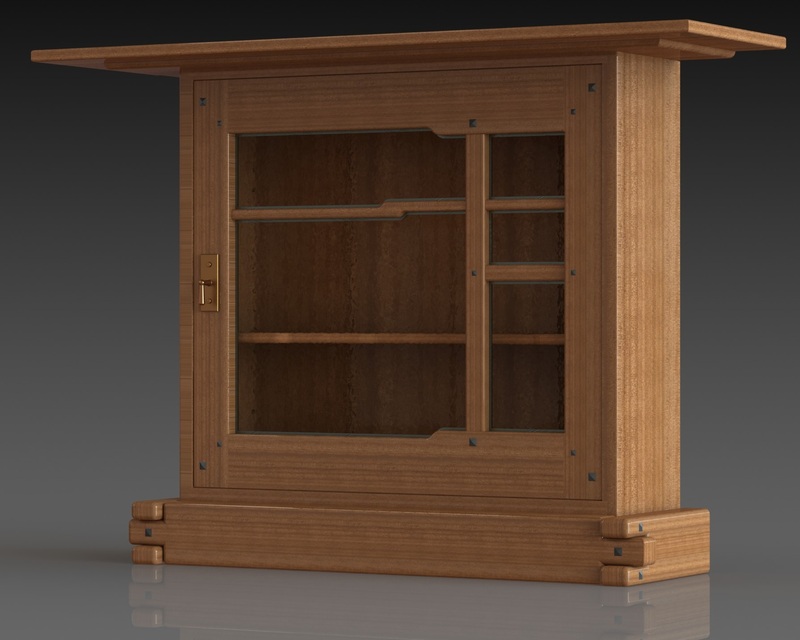 As I was thinking about the handle for the “Thorsen cabinet” last night I decided to update my CAD model to include it. That always helps me think through what to do. The price to buy this is more than I want to spend, although I’m not quibbling about it being expensive pre-se. I know that this takes someone time to make in small batches. I think I could probably make one on my lathe in a couple of hours, although it’s pretty fiddly work. The handle itself would be two small tapered shafts, one with a ball turned on the end. The ball would need to be counterbored for the second tapered shaft. Then the parts could be silver soldered together. Or, plan “B”, I could fabricate it in wax and take it to a local art foundry to have it cast in bronze via the lost wax process. I’d have to check on the cost for doing that, it might be prohibitive. I made a few other updates, I added the shelf pin holes and a shelf with a sculpted edge, and started working out how to do the lead reveal around the edge of the glass. I found a few small errors in the model and corrected them too. Once I get all of the carcass assembled I’ll update the plans with the details on the door construction and publish an update. For today, it’s about time in the shop. I really like this design, and “props” to Dale Barnard for the design adaptation from the original (larger) Thorsen house cabinet. I thought it would be good to take a look at the original, so I bought the Makinson book that was supposed to have a picture of the original cabinet (I was surprised there was a G&G book I didn’t have!). Sure enough, page 142. The cabinet I’m building is pretty obviously a direct derivative of this, using the layout of the left door but with square proportions. Looking at the original cabinet I’m stunned at how well the shapes and proportions work together, and how well it’s integrated into the room. 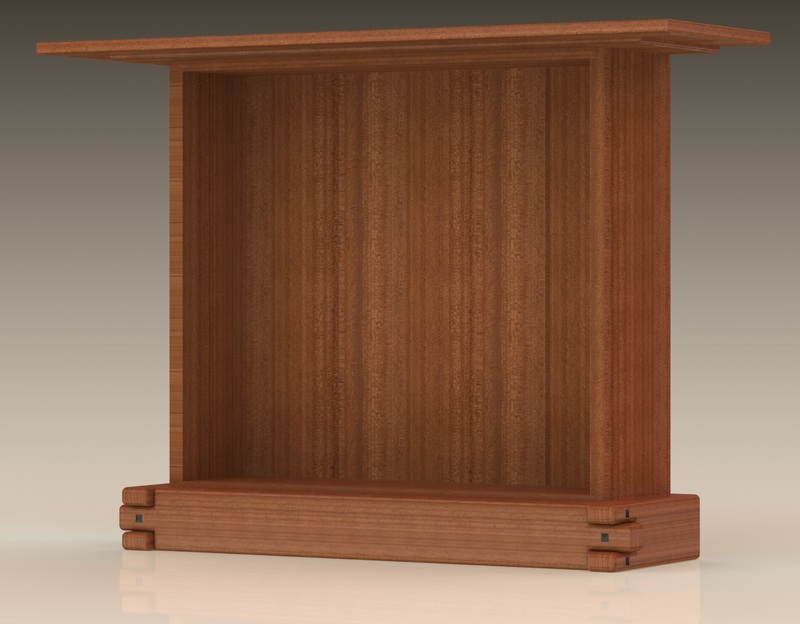 Check out the built-in supports, and how the trim on the wall follows the shape of the supports and the cabinet top. OK, wow. It’s worth noting that the original cabinet doesn’t have a pull, but instead has what appear to be carved escutcheons as are seen on other G&G cabinets. They generally made carved ebony handles for the keys that opened the locks. This might be another approach to the “knob situation”. It’s been a busy week at work, and I’m looking forward to making some solid progress in the shop on this new Greene & Greene cabinet that is inspired by an original cabinet in the Thorsen house. I’d like to get the carcass all together, and that seems realistic. I’ve finished milling the Sapele for the body of the carcass, and I just cut the dados and rabbets to assemble it. I need to drill the shelf pin holes, and drill the mounting holes for the skirt. Then I can start milling up the wood for the back of the cabinet and the door. 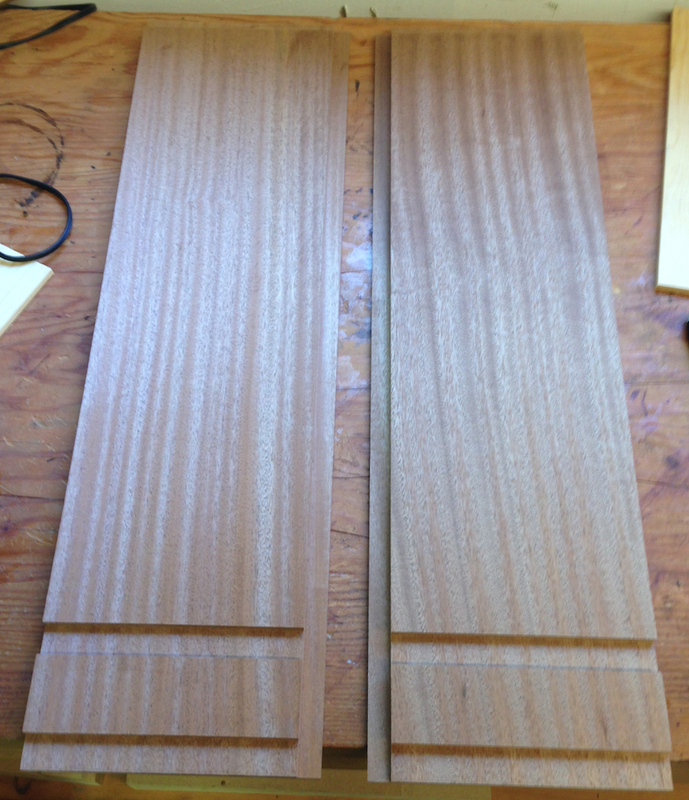 I should probably go buy some 5/4 or 6/4 stock for the door — which wants to be 1″ thick the way it’s designed. I could plane down the 8/4, but that seems wasteful. Stuff I need to buy still: plug cutters to plug the screw holes that attach the skirts. The screws don’t show unless you take the front skirt off, but it should be finished. I need to buy or make the handle too. 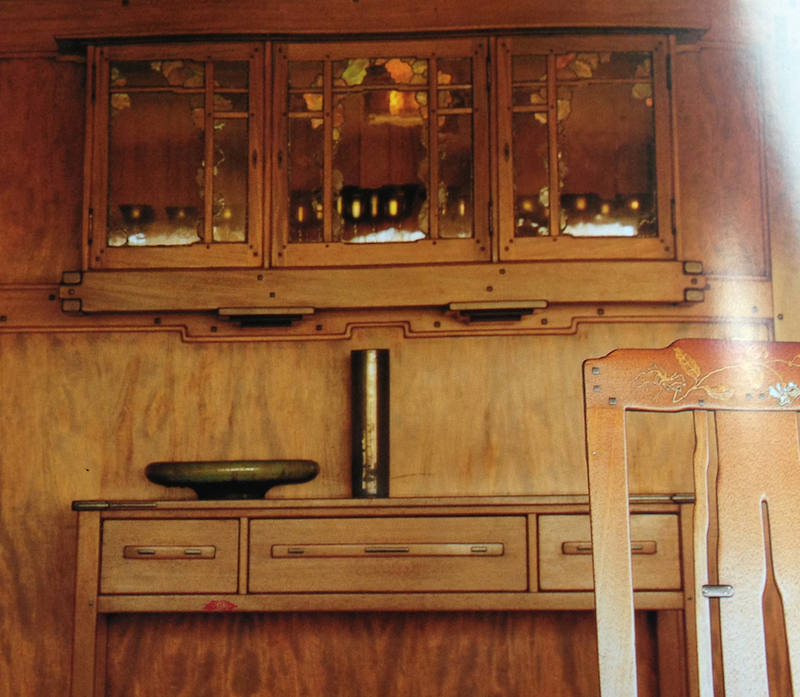 Dale Barnard, the man that designed this cabinet, sells a custom brass handle that is modeled after the Gamble house kitchen cabinet handles (as I understand it). At $80, it’s a little steep for my budget though. I used my power tools to get to this point, I will final surface the inner faces and exposed edges with my hand planes, followed by a light sanding before I do the assembly. That reminds me, I’ll need to raise the grain on the inside faces before I final sand it, it’s nearly impossible to do a nice job on that once the cabinet is glued up. No time in the shop today, too many other activities. My son’s 14th birthday, a trip to the Urgent Care center for some stitches (for me) — just the usual weekend fun and games. 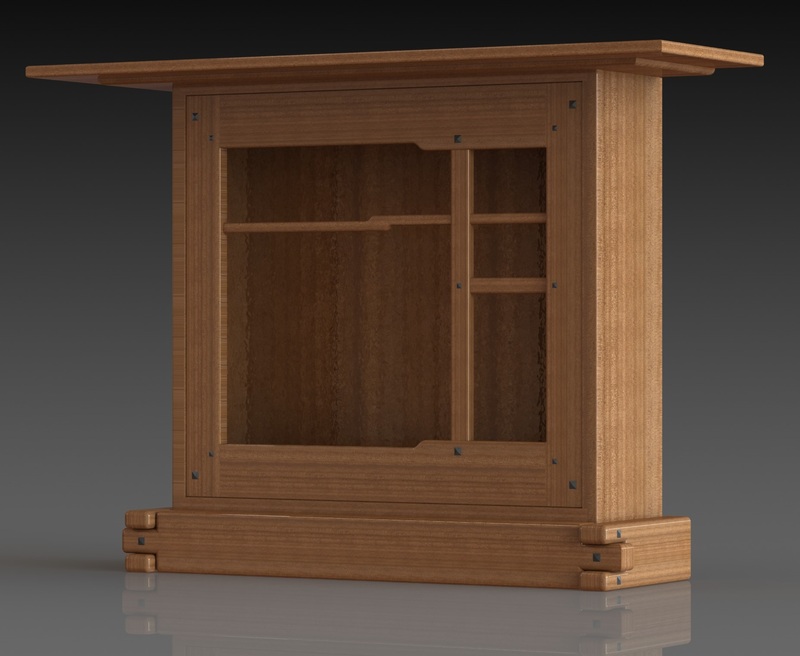 But, I did sneak in an hour or two early this morning before anyone was awake and got the door for the Thorsen House Cabinet modeled in CAD. This really helped me understand how the thing goes together, the instructions that came with the video were a little thin on details. I ended up watching the pertinent bits a second time to be able to see how the parts of the door related to each other. I want to model the stained glass and the construction details for that next, this rendering just has plain textured glass in it. Yjr stained glass that will go in this is mostly clear, with “clouds” of colored glass floating toward the top. I’m not sure I like the way the glass is held in in the video version of the cabinet, it looks a little heavy handed to me, so I’ll probably play with that some. I also need to decide what to do for the handle (and add hinges, of course). 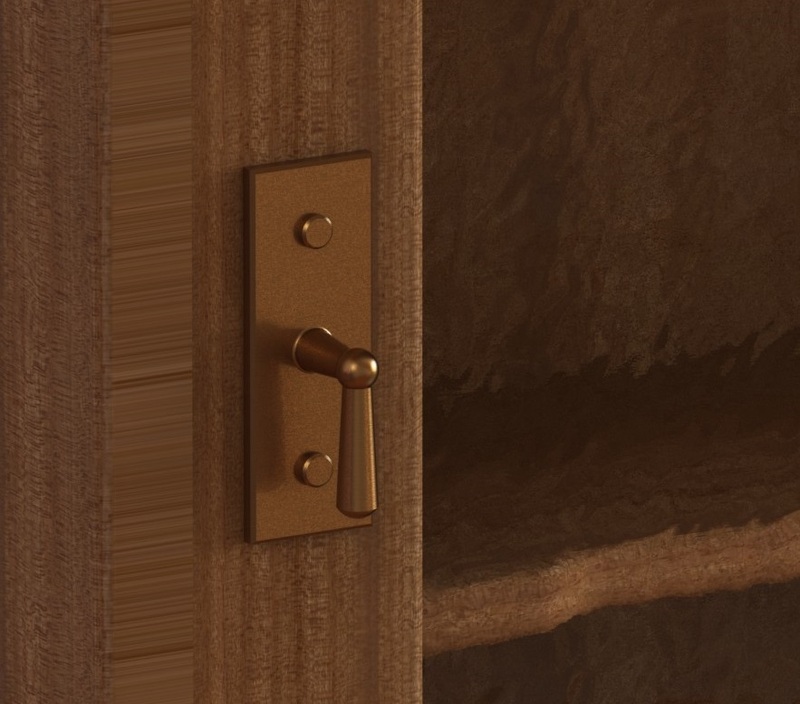 The handle on the one in the video is a recreation of the handles from the Gamble House kitchen, I think I’d like to make my own. More stuff to figure out. I have a few bits to buy to move forward on this (hinges, keyhole brackets, some 5/4 Sapele so I can make the door 1″ thick), good thing I’m not in a hurry. Last weekend I took my son to the Maker Faire, and of course while we were there we had to get a souvenir. 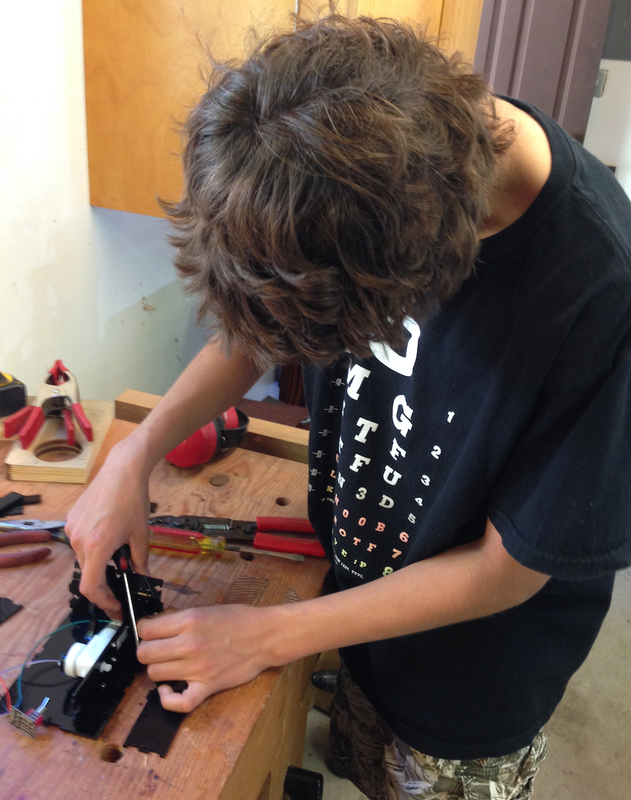 Kolya chose a “useless box kit“. If you don’t know what a useless box is, read along. The video below will demonstrate the silliness better than words, but in short it’s a box with an “on” switch on the top. When you turn it on, an arm reaches out and turns itself off. The magic is a small DC motor and a double-throw switch. When you turn the switch on the motor rotates in one direction, moving the arm to flick the switch, reversing the motor. There is a limit switch in the reverse circuit that is triggered when the motor reaches the retracted position. The instructions were clear, and assembly was straightforward. Kolya soldered most of the connections and assembled the box, I got to say (over and over) “did you read the instructions”? Thanks to one of us carefully reading the instructions and testing the operation before we assembled it, the box worked on the first go. It’s a fun little project, and now I want to make one for my office. But with a nice dovetailed wood box. I’ll let visitors discover it on their own. 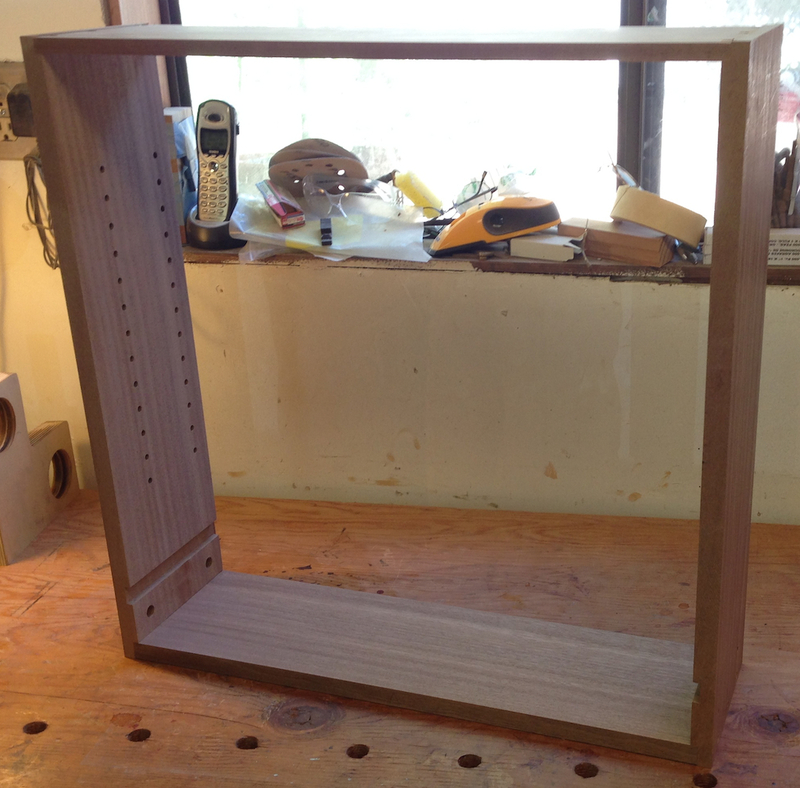 It doesn’t look like much, but I got a decent start on the Thorsen Cabinet yesterday. I spent a couple of hours tweaking the CAD model — spread out over the day — as I found errors or missing information. I also started developing printed plans that I could take to the shop as a reference. The CAD model doesn’t look substantially different, but I made several small adjustments to the details. This is the first version of the plans that I’ve posted — there will be more as I build this project. 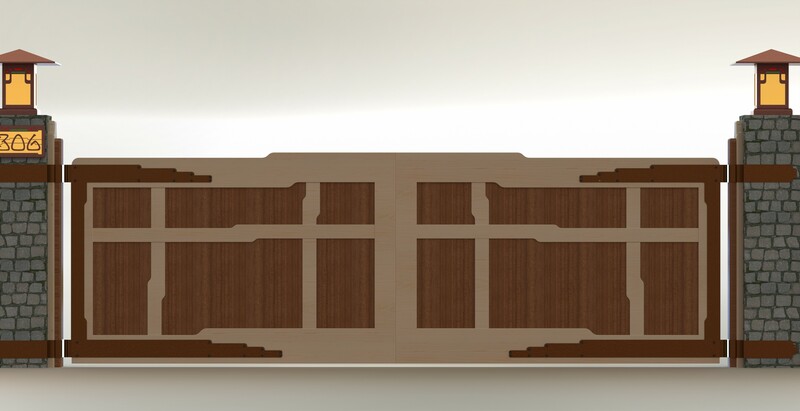 At the very least I’ll need to draw up the door for the cabinet and patterns for the stained glass. As I build it I’m sure I’ll discover errors or construction details I want to add in. My main goal for the day was to rough mill all the lumber for the case. I accomplished that, although I forgot about the back somehow. I wanted to get the wood flat and square, then give it time to “acclimate” — which I’m convinced really translates into “warp”. Today I’ll see if it moved and get it machined to final dimensions, cut the rabbets and dados and get the carcass mocked up. We’ll see how far I get, I also have a project I want to do with my son, and that takes precedence. The Sapele seems to machine without any particular tendency to tear out, I’m eager to see how it reacts to final finishing with a hand plane. I’m already wondering how I’ll finish this. The color is brownish-pink, and it darkens over time to a reddish-brown — although with finish on it that will take years I expect. I think I’ll probably want to use a little dye to get to the color I want, then topcoat with oil and shellac. I’ll need to do some sample panels later. 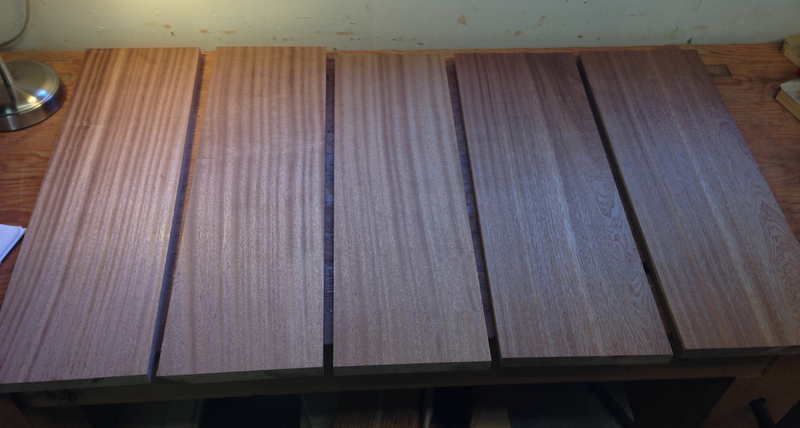 It has more color already than most of the Honduras Mahogany I’ve worked with. Wood for the cabinet case. The two leftmost oars are the sides. Stickered and acclimating. The 8/4 board is for the aprons. It’s a long weekend, and I don’t have a new wood project that I’m starting on. I have bunches of ideas, including a couple that I have enough dimensions worked out that I could buy wood and start on them, but no clear winner. 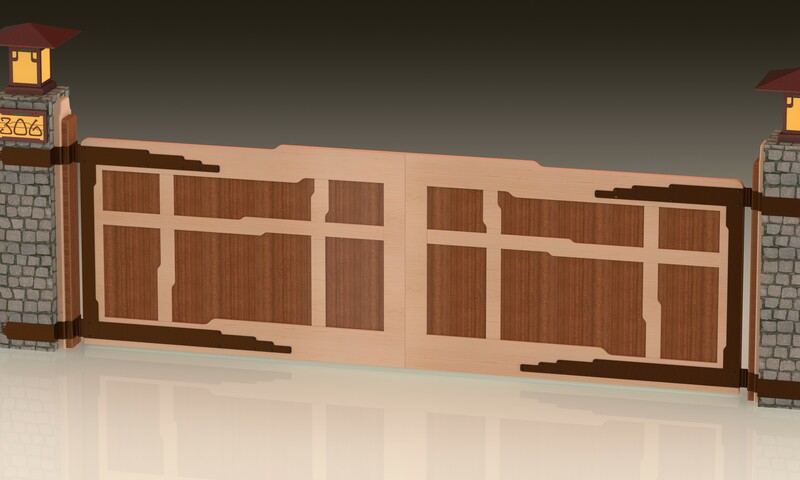 I want to make this Thorsen-house-inspired cabinet, Popular Woodworking just recently did a video on making that. I like the finished piece, but I don’t care for how it’s built (plywood back, drywall screw construction) so until I work out how I’d make it I’m holding off. Plus my wife has a framed poster hanging where I want to put the cabinet and she’s not willing to move the poster. Yet. I thought about a neat light for the dining room, but SWMBO voted that one down too. Not that it matters as I don’t have the design done anyway. Sigh. So I’m sitting at the CAD workstation doodling up ideas that I could start on. Here’s one: A simple (ish) Greent & Greene entry door. Actually, it would work better as pair of french doors, which is where I stole the inspiration. 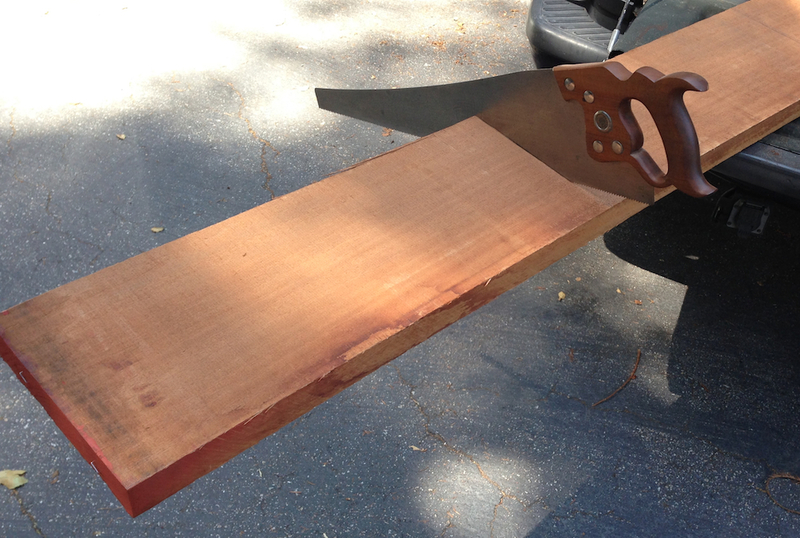 I started with the measurements for my front door — 30″ by 78.5″. I draw a rectangle that size and then added in the lines to represent the rails and stiles. Meh. It’s OK for a start. I decided to make it 3D to see what it would look like. The outer frame is 1.75″ thick, and I inset the inner cross members 1/8″. 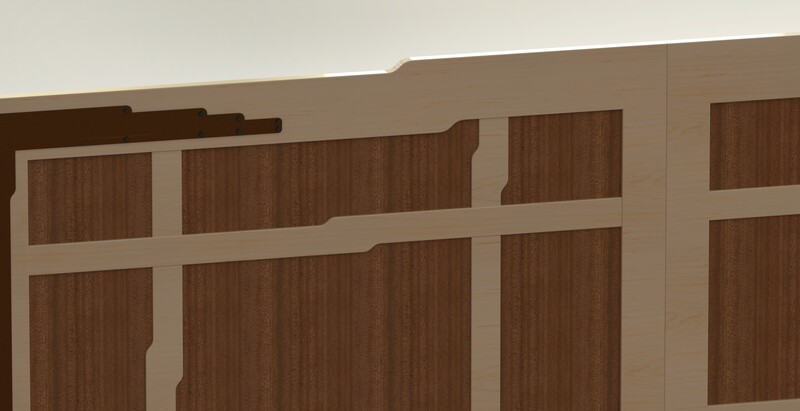 I added in a glass panel (this is all quick and dirty CAD modeling, maybe 30 minutes tops), applied “mahogany” and “glass” as the materials and rendered it to get a quick idea of what it would look like. 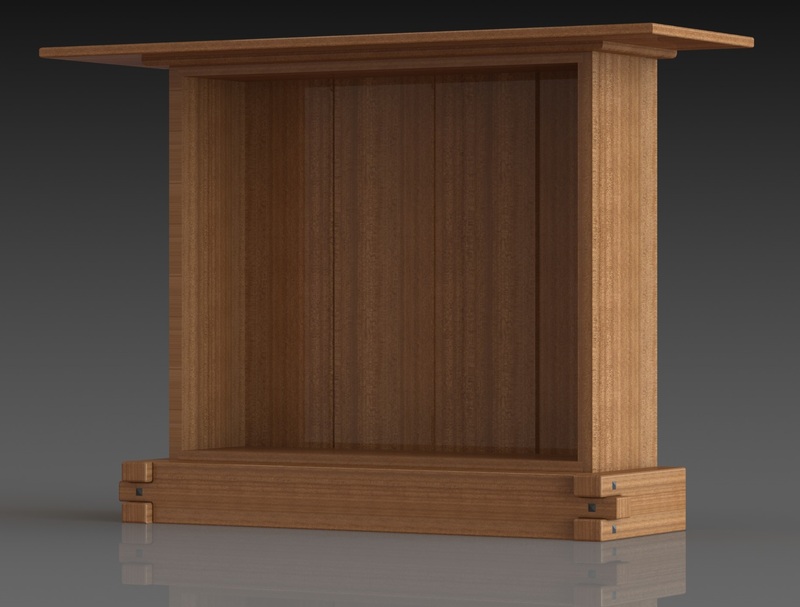 I did a render in “pine” to as I might try making it in Yellow Cedar…if I make it. The clout lifts on the top and bottom stiles aren’t right — they are too big. Otherwise it’s OK. 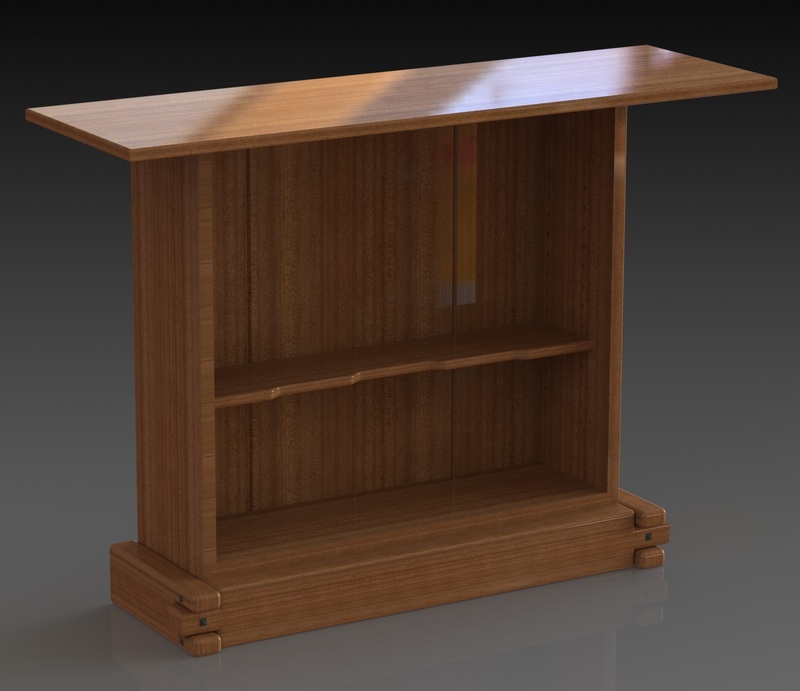 Quickie model rendered using a dark wood. The glass should be clear — I wouldn’t make it with frosted glass. In “pine” with clear glass. 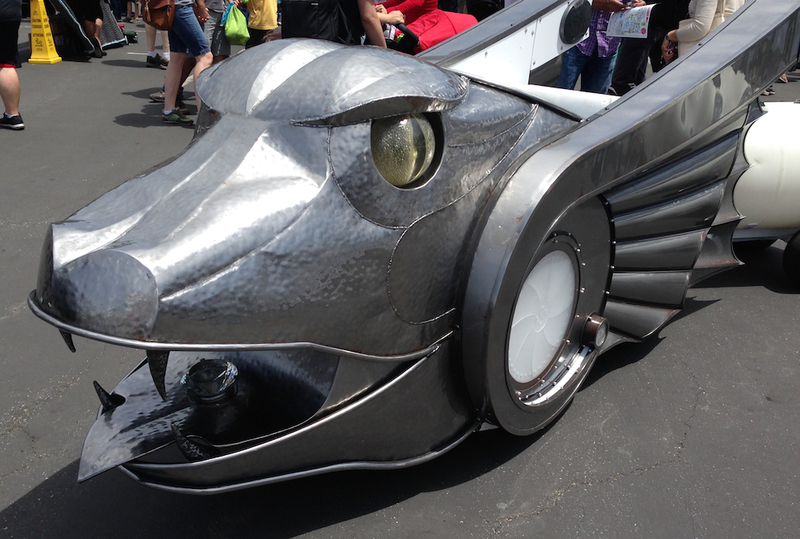 Last weekend I took my son to the Maker Faire. 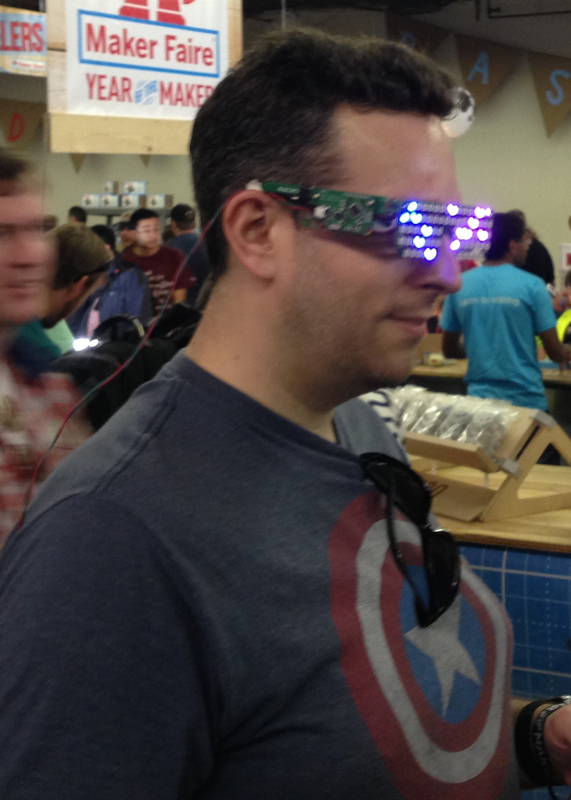 This is a event sponsored by Mark magazine, and caters to the current “maker movement”. 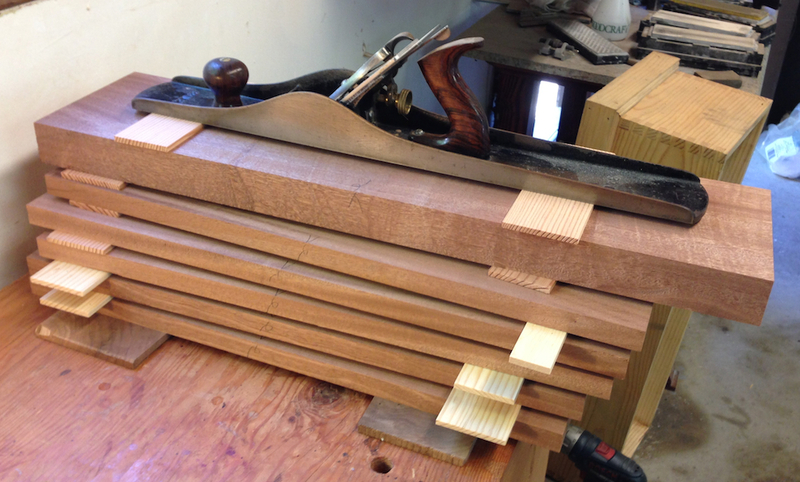 I like to make stuff, and I call my blog “McGlynn on Making” after all, so why not? I haven’t paid a lot of attention to “makers” in the current vernacular, although I had an idea of what to expect. I had the right idea, but my sense of scale was WAY off. First, the event was absolutely mobbed. It was way oversubscribed. There were huge traffic snarls in the area to get there, and you had to park miles away and take a shuttle bus to get in. The fair grounds were packed, so it was hard to see a lot of the things there, and there was something for everyone. The overcrowding was the main downside for me. 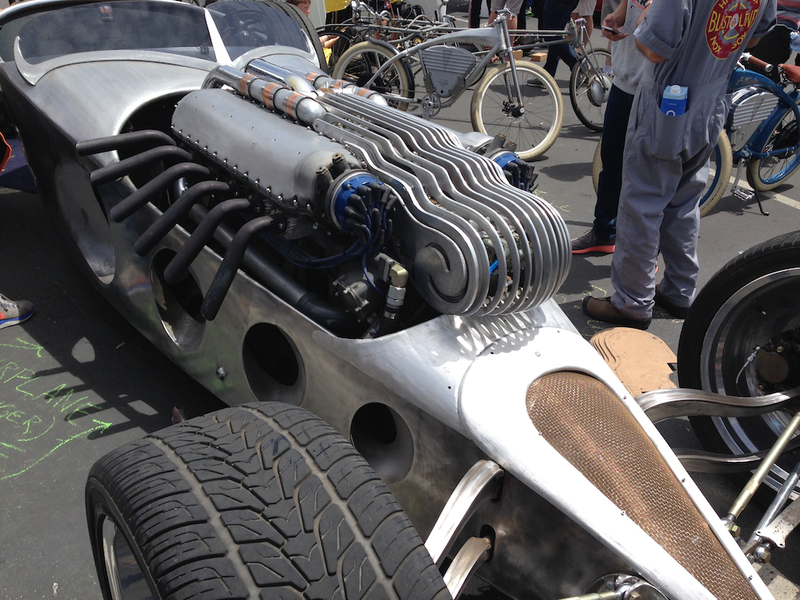 The event is a unexpected mashup of artists, computer nerds, electronics geeks, and hobbyist fabricators. I mis-typed “hobbyist” and my spell checker auto-corrected it to “hobbits” at first, and that wasn’t really wrong either. It’s a strange stew of science and steampunk. Except for the overcrowding I could have gotten lost in the exhibits. There were displays of different projects, makers selling their wares and vendors selling tools, parts and supplies. There were performances that blended science and art, and classes on everything from soldering to lock-picking. I’ll share a few pictures, but these aren’t really representative of the event — just a few images that caught my fancy. 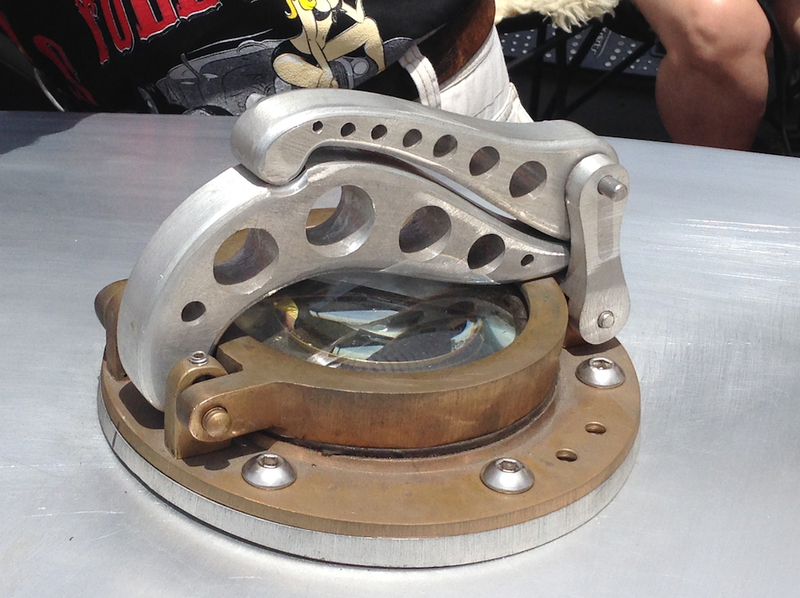 There were dozens of vendors selling fabrication tools geared for the modern maker — and this is a weird disconnect. When I make stuff I use tools that I guide. It’s at least in part a skill thing. 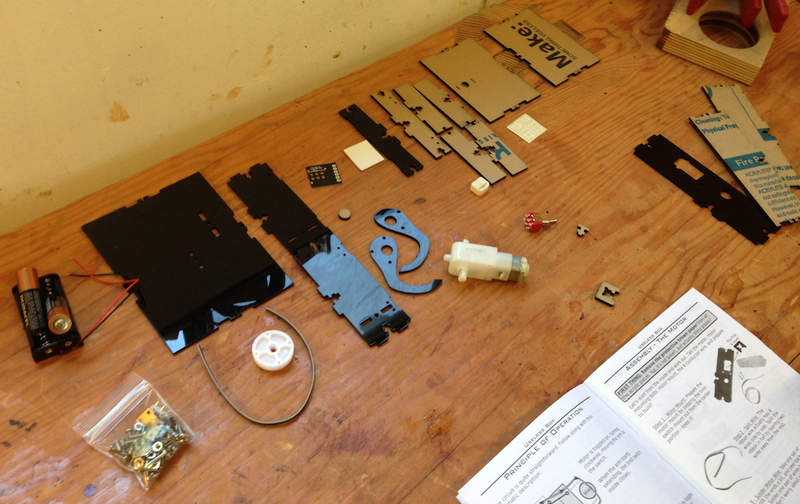 I’m not opposed to rapid prototyping or CNC — I’ve done that too and love that sort of work. But I don’t think there was a single vendor selling saws, mallets or any common power or hand tool. Instead there were dozens of vendors selling 3D printers, desktop CNC mills, CNC routers and related computer-controlled tools. All of these were hobbyist-oriented (a few were Hobbit-oriented). All in all, interesting. If I go next year I’ll be better prepared for the crowds, although I think I should organize a group of guys to demonstrate or teach classes on more traditional making techniques like cutting wood with a saw or shaping metal with a hammer. 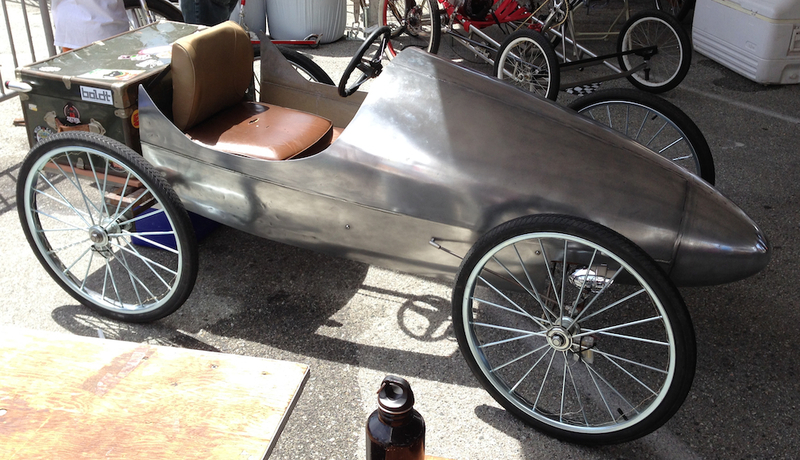 One of a wide variety of pedal cars for the pedal car race. I liked this one, but no two were alike. Some were crude, some were art pieces, a few looked like cupcakes. Gas cap on Michael’s hot rod. I love this kind of gas filler, I’ve made two of the same design myself as products that I used to sell. I spent an hour or two tweaking the design for the new driveway gate. I have more to do before I start building anything. 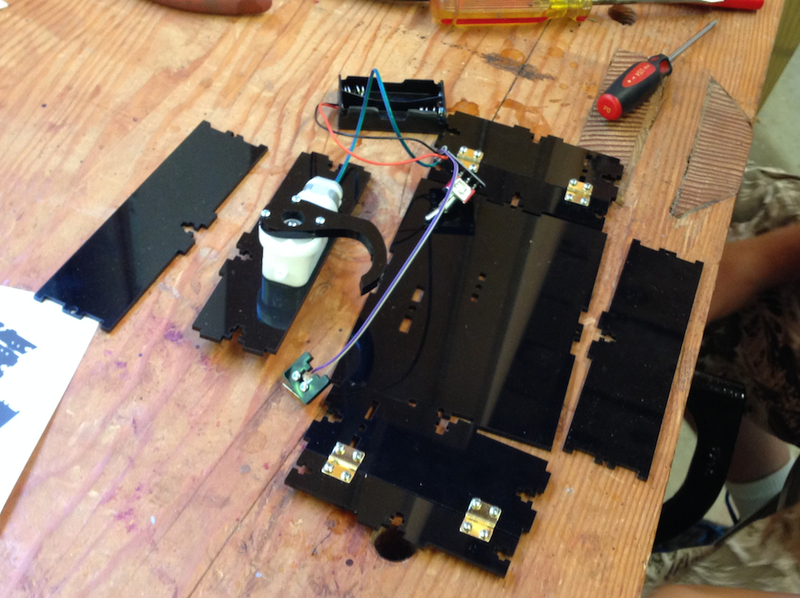 The next thing I need to figure out is the design for the hinge mechanisms. I think I have an idea how that should work, and my game plan is to build the bracketry, wood spacers and hinge leafs first, then build the gates to fit that. The main changes in this revision were the shape of the “cloud lifts” and the brackets on the block wall. The cloud lifts looked too abrupt in the previous version. I increased the space between the beginning of the sweep between the top and bottom, made the sweep angled and increased the radius on the curves. 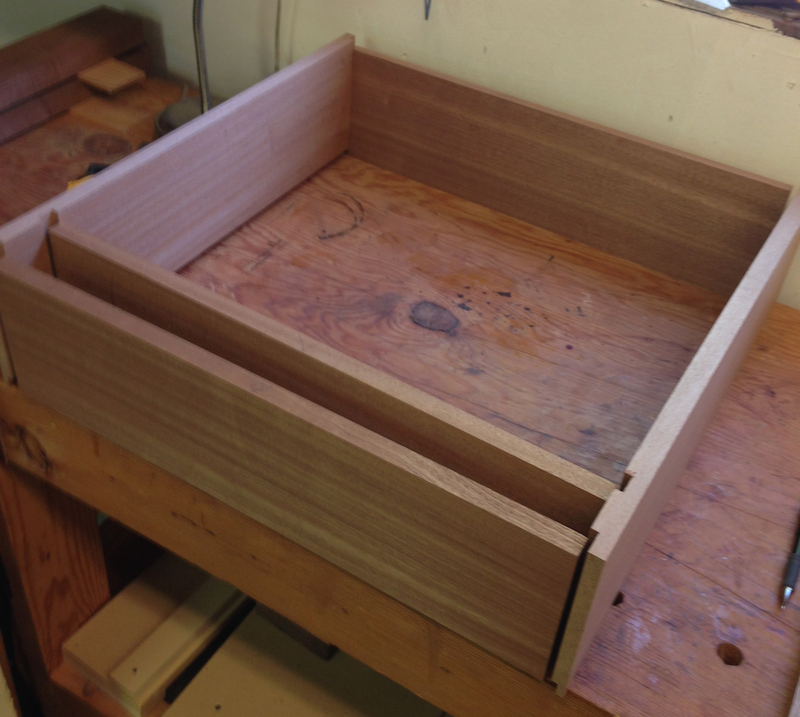 I also recessed the rails 1/8″ from the outside frame, and the stiles 1/8″ from the rails. I started modeling the steel straps that will wrap around the cinder block wall, they need a little more work on the end details. I also removed the latch that was at the top of the gate — I decided that while it looked neat it would be awkward to operate. So I’ll need to design a normal latching mechanism. Once I get the hinges and latch design sorted out I’ll order the steel, hardware and bearings for the those parts and start in there. This weekend is going to be a “wash” though as I’m taking my son to the “Maker Faire” up near San Francisco. One of the displays I’m eager to see is the CNC Pancake Maker. I kid you not, check out the “pancake bot“.